As a rabbi blogger who writes about sports, I'm always interested in the values that can be learned from watching sports. There are many situations in which the players, coaches, management or fans will do something that leads us to discuss how the situation was values driven. In Detroit, there are three situations that occurred here recently that I believe speak loudly about our values. One of these events makes Detroit look good. The other two? Well, not so much. The first occurred in mid-August at Comerica Park, the home of the Detroit Tigers. It was an event that had little to do with Detroit's baseball team and much more to do with the Detroit fans. It was a scene that made me proud to live in Detroit. When opposing player Jim Thome hit his 600th career home run against the Tigers, fans at Comerica Park gave Thome a thunderous ovation. The Detroit Tigers' faithful didn't simply stand and applaud as their team's opponent circled the bases. They maintained a long and lasting cheer for the future Hall of Famer who has had a career of hurting the Tigers. Thome has hit over 65 home runs against the Tigers (more than against any other club) and no matter which team Thome has played for (Cleveland Indians, Chicago White Sox or Minnesota Twins) he has always found success against the Tigers. This strong demonstration of commendation for an opposing player led sportswriter Pat Caputo, writing in the Oakland Press, to ask if it was appropriate for Detroit fans to give Jim Thome such a thunderous standing ovation. He argues that while "on the surface, that's the way it should be, considering the magnitude of the moment. I mean only eight players in major league history have hit 600 or more career home runs... But it was a 3-run shot and turned a close 6-5 game into a bit of a rout. It was one of two home runs Thome hit Tuesday. The other was a 2-run blast that broke a 3-3 tie. The Tigers are in a pennant race. Those home runs were extremely damaging to their cause. Should fans really have been cheering Thome so lustily under the circumstances?" Caputo had no problem with the enduring standing ovation because he believes that "baseball lore trumps all," but many fans who called into his radio show and his co-host Dennis Fithian were really upset by the response of the fans inside Comerica Park and called them "dupes." For me, I thought this was one of the highlights of the Tigers' memorable season. It was an emotional sight to see Detroit's hometown fans showing so much respect for an opposing player who accomplished such a momentous feat. Despite Jim Thome's 2-run home run that broke a 3-3 tie in that regular season game, the Tigers still won the division and made it to the American League Championship Series. That home run didn't change that, but it did make Thome feel good to have received such a rousing ovation in an opponent's ballpark. And it made me proud to be a Detroiter. The other two events did not make me feel proud to be a Detroiter. And they both occurred yesterday on Thanksgiving day at the Detroit Lions game. The first has nothing to do with sports, but a lot to do with respect. The halftime show at the Lions Thanksgiving Day Classic always attracts big name recording artists like Kid Rock, the Allman Brothers Band, and Mariah Carey. This year Canadian rockers Nickelback was invited to perform at halftime. Some Detroiters disagreed with the decision to have a Canadian band perform on Thanksgiving Day. Others disagreed with the choice because they don't find Nickelback to be talented musicians and they don't care for their music. Thus, a petition was circulated on the Web by a University of Michigan student at change.com that ultimately had over 10,000 signatures urging that Nickelback be banned from performing in Detroit. The irony of this is that Detroit is one of the band's strongest markets. Ultimately, the petition didn't do anything other than stir up some controversy, lead to Nickelback having some fun with the situation and making a FunnyOrDie parody video, and launch an alternative half-time show by Jewish musician Mayer Hawthorne (né Andrew Cohen) outside of his parents' home in Ann Arbor. When Nickelback took the stage at Ford Field, the Detroit fans should have applauded them. Even if they don't care for their music and even if they would have preferred American performers, it only makes Detroit look bad when the hometown fans booed the band. Detroit is working hard to improve its image and booing the halftime show performers on national TV is not a step in the right direction. The third situation occurred not long after the Nickelback halftime show when Detroit defensive tackle Ndamukong Suh was ejected from the Lions-Green Bay Packers game. Suh stomped on an opposing offensive lineman after pushing the player's head onto the turf twice. Suh was flagged for unsportsmanlike conduct and ejected from the game. This stuff happens on occasion in the rough and tumble game of football, but it happens when Suh is around much more often. What actually occurred on the field is not what I look at for a lesson in values. Rather, it is Ndamukong Suh's post-game explanation that makes him look bad (and by extension his team and Detroit). In a press conference following the game (he probably shouldn't have participated in any interviews), Suh said, "I want to apologize to my teammates, my coaches and my true fans for allowing the refs to have an opportunity to take me out of this game... What I did was remove myself from the situation the best way I felt, with me being held down." Suh then went on to try to defend himself, saying he was trying to keep his balance while freeing himself from the brief scuffle. His fabricated story went like this: "My intention was not to kick anybody, as I did not, removing myself. I was on top of a guy, being pulled down, and trying to get up off the ground -- and why you see me pushing his helmet down, because I'm trying to remove myself from the situation, and as I'm getting up, I'm getting pushed, so I'm getting myself on balance." Suh is a professional athlete and represents his team. He is an adult. The story he tells to defend his unsportsmanlike antics sounds more like a defense that a child would concoct to prove his innocence. Suh shouldn't have pushed his opponent's head into the turf and he shouldn't have stepped on him while he was down. But what he should have down afterward was own up to his actions and apologize. That is not the image that Detroit wants to convey. Especially not on national television. I'm a proud Detroiter and a proud Detroit sports fan. It's moments like the one in Comerica Park this past August when Jim Thome made history and the fans recognized that beautifully that make me even prouder to be a Detroiter. It's moments like the two that happened in Ford Field yesterday that should remind us that we can do better. Jason, there was another very memorable moment recently, I believe LAST year when Galaraga's perfect game was stolen from him by a horrible call by the 1st base umpire. He, Leyland, the Tigers and fans handled it with a tremondous amount of dignity and calm by accepting the umpire's decision, even though the replay clearly showed the decision to be a blown call and not a correct one. Although not happy with the horrendous call and the lost perfect game (which I was at), I was so proud of Detroit and the way the situation was handled. That is how teams and cities acquire reputations. 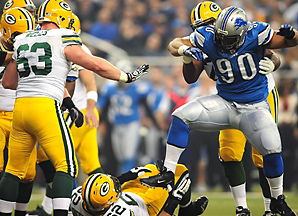 Unfortunately, so was Sunday's football game and Suh's antics.